Duplicate File Remover Pro finds duplicate files, folders and even similar folders – Similars. Choose a folder for duplicates scan and scan it. 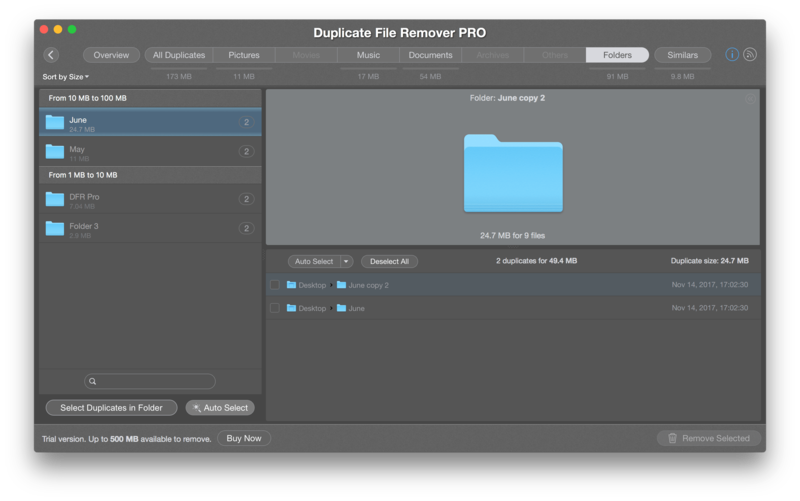 Duplicate File Remover Pro will show overview screen with scan results. Click on Folders button to preview folders’ duplicates. For every folder (on the left list) you can preview its duplicate folders, just click on it, on the right side you will see folder’s duplicates. Here you can select duplicate folders for removal, tick a folder to select it. Select unneeded folder duplicates for removal, by ticking them. Small progress bar under Folders category represents the whole category’s duplicates size on a disk. Green line represents selected duplicates for removal. Blue line – folders that will be kept, as “original”. If you selected all folders for removal option, not keeping original folder, the progress will be red. Red part means you selected all items for removal. If you want to be able to remove all files and folders entries, including original item, you should enable the option in application’s preferences. 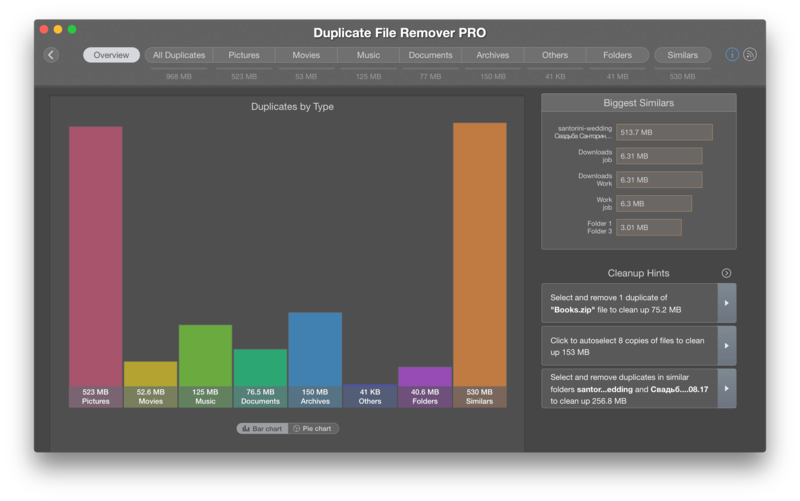 Typically you can have files duplicates, folders duplicates, and similar folders. Similar folders contain some files that are duplicates to another folder’s files and some files that are unique.